No literally, I took more strides today...on the treadmill! I was able to do 2 full miles without losing my mind. Tomorrow's goal - 2.25. Baby steps! The treadmill said that I burned 315 calories, but I never believe what the machine tells me. I keep saying that I want to invest in a HRM to keep track of my speed, distance and calorie burn accurately. One of these days! Today was also my first day trying out the new sneaks! They were so incredibly comfortable and no knee pain whatsoever. Let's hope I feel the same on Friday during my 4 mile road race! When I got home from the gym I was starving - lately my body seems to need food so much more! Hopefully it's a sign that my metabolism is speeding up. Pretty much every 2 hours my stomach starts grumbling again. I've been eating extremely clean and healthy and snacks usually consist of a piece of fruit with or without homemade nut butter, carrot sticks or a homemade bar (my new favorite thing is homemade Larabars). To keep myself from snacking I jumped straight in the shower and immediately came down to start cooking dinner. We had a bunch of random leftovers in the fridge so I decided to throw everything together. 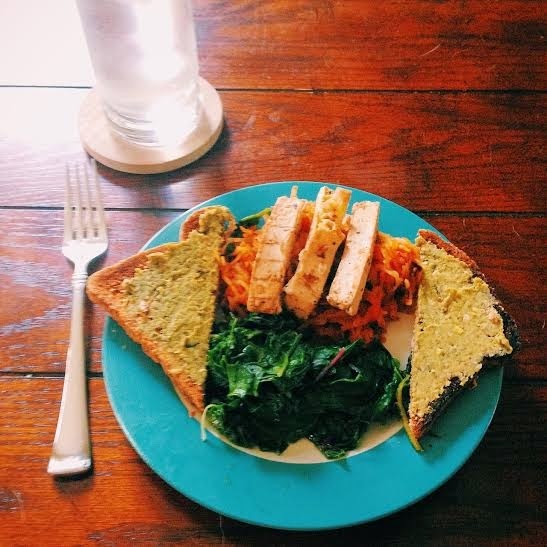 I came up with spaghetti squash, marinara sauce, black beans & greens topped with Follow Your Heart Chick'n Strips, a side of sauteed rainbow chard and garlic and a slice of Ezekiel bread topped with oil free pesto spread. Is it just me or is this week going by insanely slow? I'm not quite sure how it is that a 4 day week can feel so long! Just 2 more days...then it's on to a nice relaxing 3 day weekend.